Our shared values of belonging, mastery, independence and generosity will create an environment that will honour the Seven Teachings of our Ancestors and all members of our community. 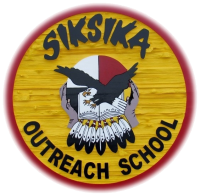 Using a holistic approach, it is our desire to support the mission and vision of Siksika Board of Education which is to provide students with an innovative and excellent learning environment and creating competent, confident and knowledgeable students. To develop capable and responsible lifelong learners proud of their identity, language, culture and their own achievements. Creating a respectful learning environment based on the balance of traditional cultural values and academic excellence. Reflect the values and beliefs of the community in which we serve.